KidStart Magazine > Saving Tips > Household savings > How much will it cost you to raise your child? According to the 13th annual ‘Cost of a Child’ report from LV=, the cost of raising a child has increased by more than £2,500 in the last year, and a 65% increase since 2003. 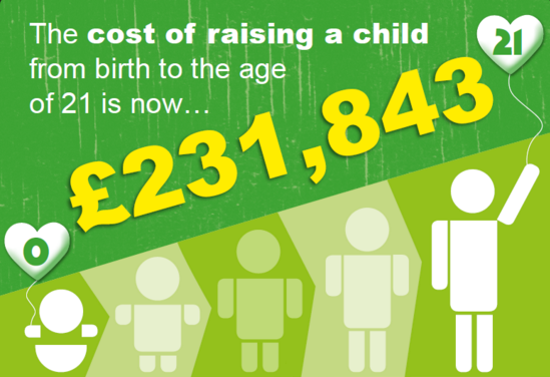 In 2016 the average cost of raising a child in the UK is now £231,843. – LV=‘s cost of a child report shows that the cost of raising a child takes up more than a third of the average UK household income. 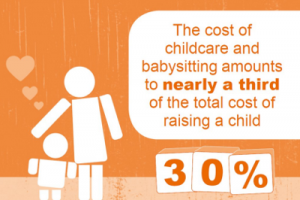 – The cost of childcare and babysitting has seen the largest increase over last year and now accounts for over third of the total cost of raising a child. – Education is the biggest single cost, accounting for uniforms, text books, school lunches and school trips. – Six in ten parents told LV= that they are struggling to manage their finances and having to become more and more resourceful about how they spend and save their money. We all know babies are expensive little people, but as they grow they will start to need their own gadgets, text books, pocket money and even driving lessons… As parents ourselves we know how incredibly difficult it is to save for all these. So it’s really important that parents have a plan in place to protect their income and a financial safety net against any nasty surprises. We’ve put together some money saving tips to help you save on the cost of raising a family. – Be a savvy shopper – look for deals and online coupons when doing your weekly shop. Read our top tips on how to save on your weekly food bill here. – Work out a monthly budget – Write down your monthly expenses and try and save some each month for a rainy day. Here‘s an example on how to do one. – Have the right cover in place – protect your family should you die or lose your income to an accident or illness. See how LV= can protect your family here. – Make sure you open an account with KidStart which allows you to earn money back for your children every time you shop online. If you’d like to know some more tips on how to save money read our recent articles filled with 9 easy ways to stretch your family budget and 6 tips to save money on your weekly grocery shopping. You can also use LV=‘s calculator to work out the cost of your child here. Simply enter their age and it will calculate the cost of raising them until the age of 21. You can ‘add another child’ and get the total cost of all your children. What are some of your tips for saving money as a family? 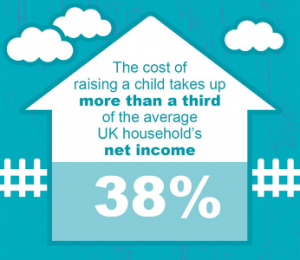 Does it shock you to hear how much children cost to raise?